AUTOMATIC PLANT CARE - Create a self-watering system to ensure your plants always have enough moisture without having to water everyday. WORRY-FREE VACATION WATERER - A 750 ml wine bottle reservoir can sustain your plant's watering needs for up to 14 days through a self-irrigation system that drips water when the soil gets dry. 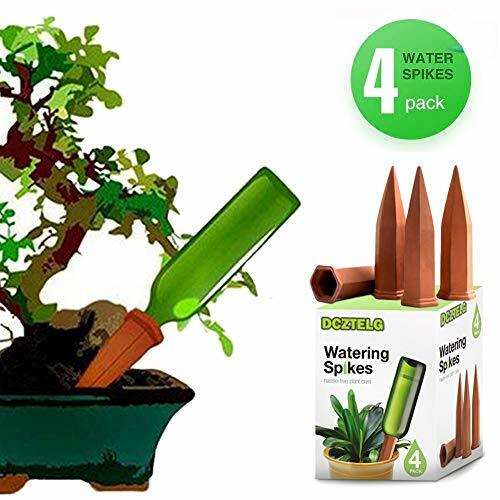 EFFORTLESS INSTALLATION - Simply stick the watering take into the soil, and place any long-necked bottle (wine or soda bottles are perfect) onto the stake and you're good to go. GROW HEALTHIER PLANTS - Automation watering prevents under and overwatering, promoting healthier roots. Plus, no overflow means you won't lose any soil or nutrients. ECONOMICAL AND EASY TO USE - Plant lover's delight! Make their gardening easier and their plants healthier. If you have any questions about this product by DCZTELG, contact us by completing and submitting the form below. If you are looking for a specif part number, please include it with your message.